There are pickup trucks, and there is the 2019 Chevy Silverado HD. The HD stands for Heavy Duty, and they are not kidding about that. This full-sized truck is as big and powerful as they come. In some parts of the world, this type of truck is considered a commercial vehicle. Trucks of this size are popular as fleet vehicles, used by everything from contractors to local and state government. These trucks are valued for their ruggedness, capability and dependability and it’s hard to find anything the 2019 Chevy Silverado 3500HD can’t do. The 2019 Chevy Silverado 3500HD exemplifies all of those traits perfectly, and then some. This truck combines all of the performance you would expect in a high-performance work truck with modern technology and convenience. These technological and convenience features cover many areas associated with a work truck, among them safety, towing and hauling. Modern technology has also afforded vehicles of all shapes and sizes certain levels of convenience, comfort and connectivity previously unknown to any automobiles, particularly work trucks. The 2019 Chevy Silverado 3500HD offers features in all of these areas. In addition to all of the power and amenities, the 2019 Chevy Silverado 3500HD is among the most versatile of vehicles. Between trim levels, cab size, box length, and rear or all-wheel drive, this heavy duty truck can be configured in dozens of different ways. At McCluskey Chevrolet, we firmly believe that at least one of these configurations is an absolutely perfect fit for your heavy duty work truck needs. Read on and discover more about the 2019 Chevy Silverado 3500HD and, if you agree, come visit us and let us show you all around this powerful truck. The 2019 Chevy Silverado 3500HD has two available engines. Both offer incredible strength and performance, which shows in their ability to tow and haul great weights. That is a very desirable asset in a work truck. Either of these engines will make the 2019 Chevy Silverado 3500HD stand out on a work site. The first of these engines is a Vortec 6.0 liter V8, which gets 360 horsepower and 380 lb-ft of torque. This engine comes standard on all trim levels and configurations. It is paired with a six-speed automatic transmission and can tow up to 14,100 pounds. 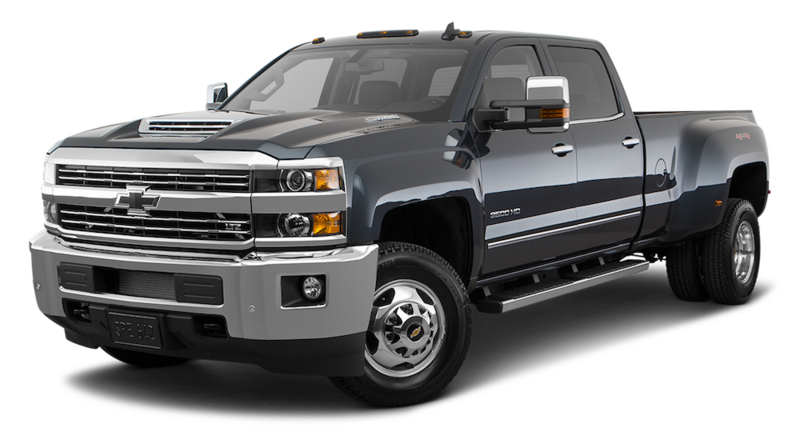 Seeing as how the max, unloaded weight of the 2019 Chevy Silverado 3500HD is no more than 7,240 pounds, the towing capacity is nearly double the weight of the truck itself. However, an optional 6.6 liter turbo diesel V8 is also available. It has 445 horsepower and a whopping 910 lb-ft of torque. All that muscle can tow more than 23,000 pounds, more than three times the weight of the 2019 Chevy Silverado 3500HD. Although Chevrolet has not released the fuel mileage for this particular truck, you can bet that the diesel engine will be significantly more fuel efficient than the regular gas 6.0 liter engine. Either of these engines have the capability of towing just about whatever you need. However, Chevy has made it even easier for you to utilize all of your work truck. Chevrolet knows all too well the value of a work truck. They also know how best to make your work truck work for you. Your job site is difficult enough. You want your work truck to be on your side, not working against you. To that end, the 2019 Chevy Silverado 3500HD has a long list of features that help your truck work in your favor. While the cargo bed volume will vary based on which trim level, cab size and bed size you select, the 2019 Chevy Silverado 3500HD has a sizeable cargo area. Whichever you decide on, you can outfit your cargo bed with a number of features, including a spray on bed liner. If you are one that uses the bed of your work truck to haul things such as building material, the cinder blocks, rebar or lumber could do damage to the floor of the truck bed over time. A spray on bed liner will give it permanent protection from the sharp corners and weight of those materials. This truck also comes with a corner step. This is a step conveniently built into the corner of the rear bumper so that you don’t have to step all the way up onto the bumper or tailgate if you are trying to get into the truck bed. You can also dress the bed with LED bed lights, in order to help you see better in the dark. As for some of the helpful tech on the inside, the 2019 Chevy Silverado 3500HD has available Stabilitrak for towing. This system will detect any sway that your trailer has and help stabilize the truck and avoid causing the weight of the trailer to cause any accidents by getting out of your control. It also has available Hill Start Assist. If you are parked on a hill, this feature, when activated, will keep the brake applied for the split second it takes you to take your foot off the brake pedal and move it to the accelerator. This will keep you from rolling down a hill unintentionally and could avoid a potentially terrible accident. These features are geared specifically towards those millions of people who use trucks like the 2019 Chevy Silverado 3500HD as a work truck. Job sites vary in location and accessibility. You never know where your next work site might be. It could be in a hilly area, or with twists and turns to get there, or both. And even though they are added with the utility of a working truck in mind, they are also all useful tools for those who use the 2019 Chevy Silverado 3500HD as a play truck. These are great tools when trailering a boat or camper, as well. One of the best things about the 2019 Chevy Silverado 3500HD is the numerous ways it can be adapted to suit your personal driving needs. Not all job sites are the same. Some may not need to do much out of the way of city roads, while others may need all the off-road performance they can get. Some will only use the truck bed sparingly, while others may spend more time back there than they do in the cab. And as for the cab itself, you may be the one that drives everyone around, or you may be the only passenger most of the time. Whichever combination of those categories you fit into, this Chevy truck has a configuration for you. The 2019 Chevy Silverado 3500HD comes in four different trim levels – the WT, the LT, the LTZ and the High Country. The WT is the base level, and it has fewer of the frills that the others may have as standard features. The LT and LTZ levels add more, but the High Country is where you really hit pay dirt. It has just about any and all safety, infotainment and comfort feature you can ask for in any vehicle, especially a work truck. You can also opt for rear wheel drive or four wheel drive. If you spend a lot of time in out of the way places with adverse road conditions, the four wheel drive option will probably be optimal for performance in those places. You may also want to have dual rear tires for further stability, as well as enhanced towing and hauling. The 2019 Chevy Silverado 3500HD is available as a “dually”. You may prefer a long box to a short box, in terms of cargo bed area. This truck offers both options. Moral of the story, if you prefer a 4WD dually long box High Country or a 2wd short box WT, the 2019 Chevy Silverado 3500HD can offer both, and every other configuration in between, for a total of twenty-four options on this amazing work truck. And that doesn’t even count some of the optional packages! The 2019 Chevy Silverado 3500HD is a big, powerful work truck with a lot to offer. If you are more the bare bones type, that wants nothing more than a strong, reliable work truck, it can be that truck for you. If you want an even bigger, more powerful work truck with all the accoutrements and features you could think of, it can be that truck for you, too. And if you fall somewhere in between… well, you can see where this is going. If you fall anywhere on that spectrum, come down to McCluskey Chevrolet on E Galbraith road in Cincinnati. Our sales staff will be happy to show you all around this beautiful truck. We will be happy to elaborate on all the features it has, and it has plenty. Our finance team can help you with a payment plan. We know all the tricks of this tricky trade, including rebates, discounts and credit rating and get set you up with a plan that works for you. Our Service technicians can set you up with a regular maintenance schedule, so you can keep your 2019 Chevy Silverado 3500HD running powerfully for years to come. We will see you soon!